Here we are at Hospitalfield again. 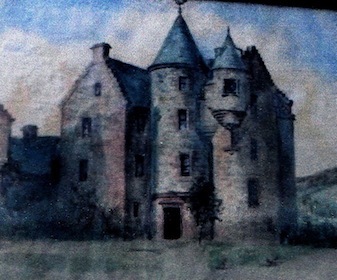 Well, no, this is Blackcraig Castle, Patrick and Elizabeth’s Perthshire property, where they came every summer for the grouse season, which began - and still begins - on the Glorious Twelfth. Which is more or less today’s date, August 10, 2013. Can I wait to get into the funny little house (cap house? crow’s nest? observatory?) that Patrick built atop this second home? I suppose I’ll have to, there are proprietaries to observe. 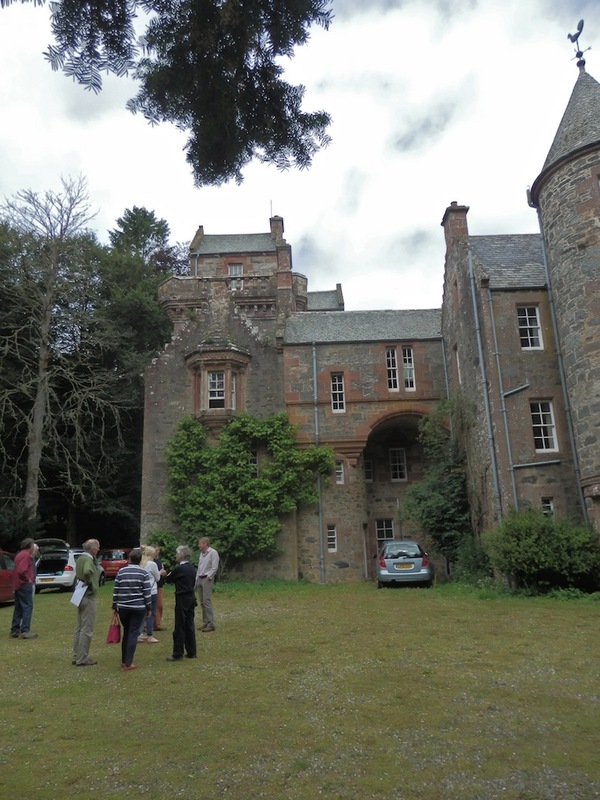 The trip has been organised by Adam Swan, chairman of the Tayside and East Fife Group of the Architectural Heritage Society of Scotland and there are as about 30 people who have turned up in cars. I drove from Blairgowrie, which took me twenty minutes. To drive from Arbroath would have taken an hour and twenty minutes. In Patrick and Elizabeth’s day, it would have taken a day to travel from Hospitalfield in a carriage pulled by two horses, assuming they trotted at seven or eight miles an hour, with stops to restore the horses every few hours. 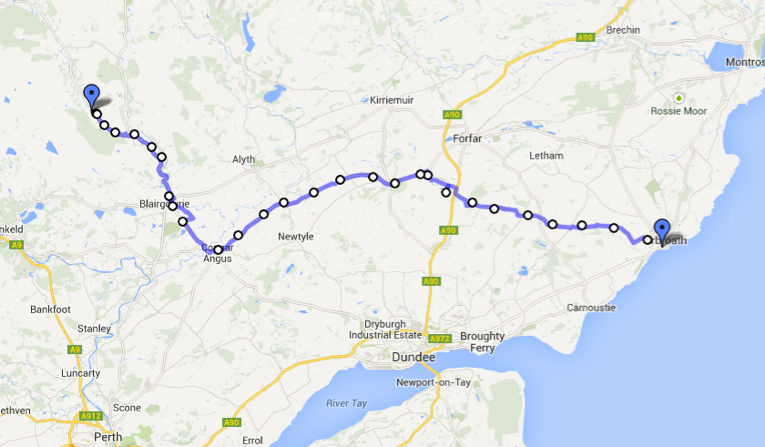 I reckon something like the blue line in the map below would have been their route, passing the imposing castle of Glamis as well as Coupar Angus and Blairgowrie. On the other hand, if a stop at Forfar was favoured (a Forfar bridie makes a pleasant change from an Arbroath smokie), the route would have carried on via Alyth rather than Coupar Angus. Back to the present. 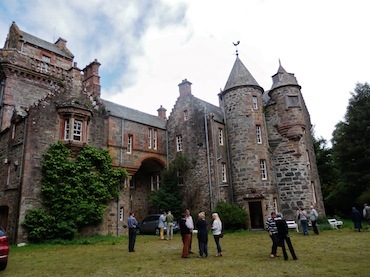 The visit begins with Adam Swan introducing the house, augmented by comments from Graham McNicol, a knowledgable volunteer guide from Hospitalfield, and Simon Green, President of the AHSS. Adam directs our attention to the watercolour in the handout, showing Blackcraig as it appeared after the first phase of development in 1848. 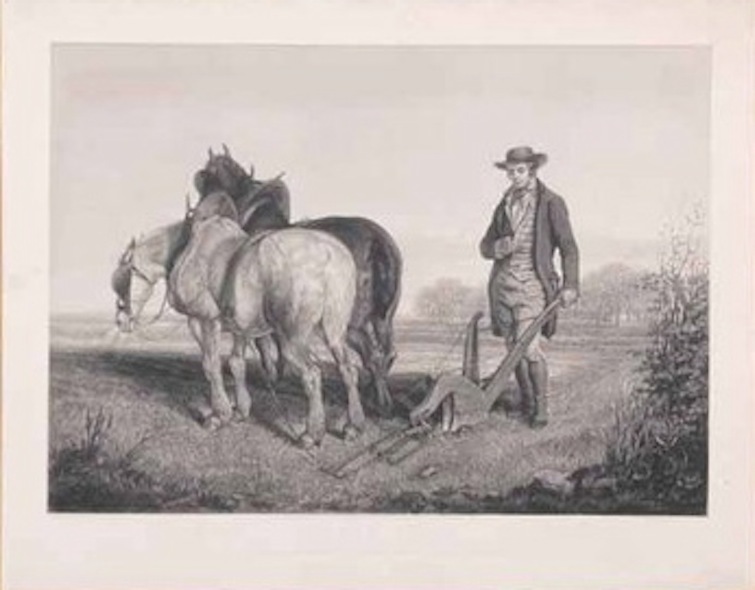 (Patrick bought the land in 1847 when there were only a handful of crofts on the estate, which stretched for three miles south of the site chosen for the house, along the River Ardle, almost to the town of Bridge of Cally.) Much of the building, including the part with the observatory, was added in later stages. 1856 is marked on the clock face so perhaps that is the date by which the majority of the building as it now stands was built. Though that clock face is on the older part of the building. That is, the building in the left-hand image below. Or the right half of the right-hand image below, which I managed to take before we stood in a listening circle. Blackcraig has just been sold, and both the outgoing and incoming owners are here today. 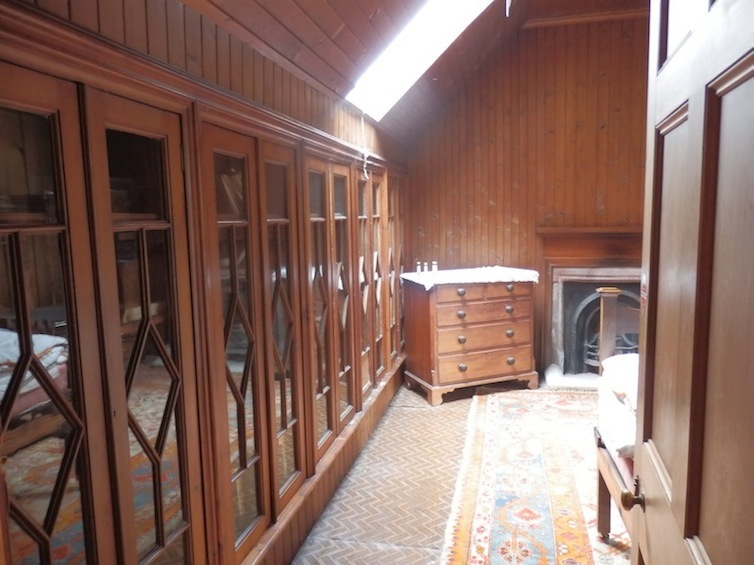 The outgoing owner tells us that the house was bought by the Forestry Commission from the Hospitalfield Trustees. The Forestry Commission wanted the land, not the house itself, so that was quickly sold on to his grandmother in 1937. The house has been in the same family since. It’s no longer feasible for the family to carry on at Blackcraig any longer. He is handing on the house to its new owners with good grace. Yes, there is a positive feeling about this day of transition. While the rest of the party are getting coffee from a machine that Adam has brought along for that purpose, I nip up to the largest and finest room in the house. 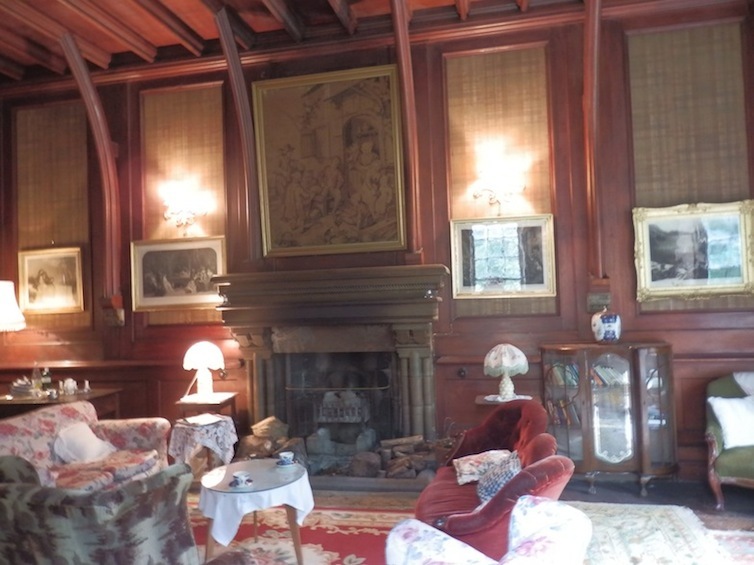 Ostensibly it’s not as impressive as the Gallery at Hospitalfield, but it’s the space that Patrick and Elizabeth may well have gravitated towards at the end of their summer and autumn days here. In the picture below, it’s a stag’s head that’s been mounted high up on the wall above the door. 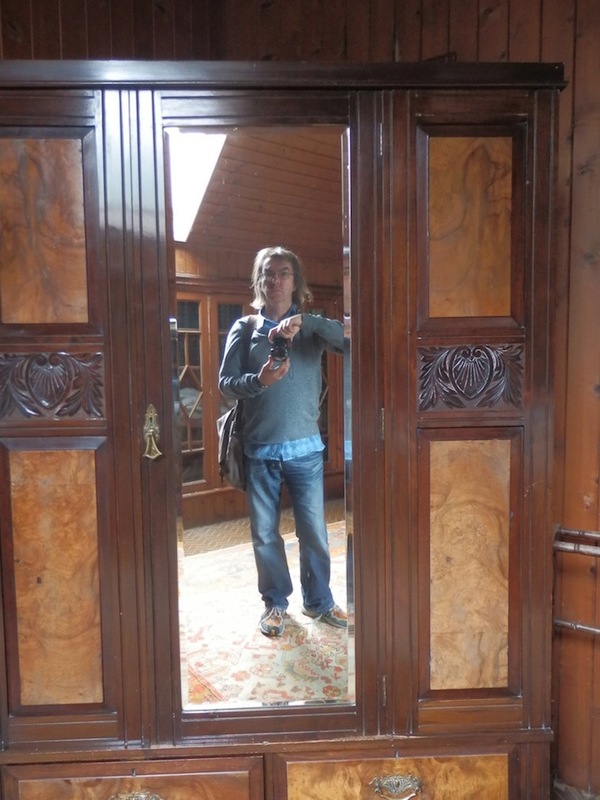 At Hospitalfield, the equivalent is bags of game (duck, pheasant, grouse) finely carved out of cedar. However, I’m struggling to get a good shot of the room. 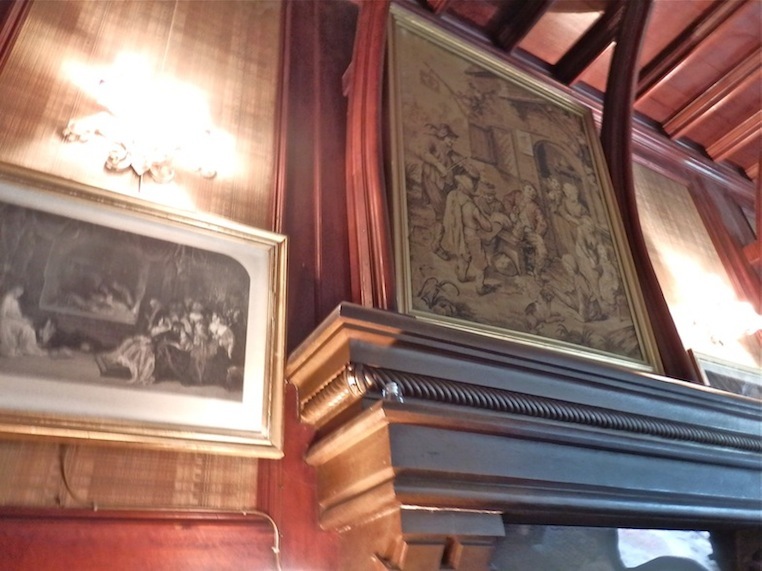 The one below shows a tapestry in the space above the fireplace. The Hogarthian scene is of a seated man drinking ale immediately outside a tavern surrounded by cheerful yokels including a man playing a fiddle. But what is the print to the left of the fireplace? Instead of investigating, I step back and take a shot of the whole wall, as seen below. There are four prints on the main display wall and three more on the walls that are broken up by windows and doors. At first glance the prints are all from the 19th Century and the gold frames are falling apart with age. 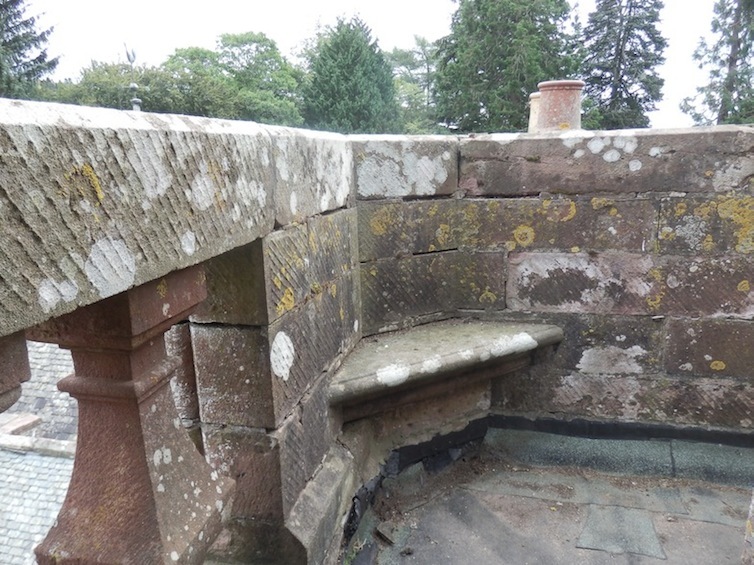 Could this scheme of decoration have existed since Patrick Allan-Fraser’s time? It’s conceivable, as only one family has been in occupation and ownership since then. The more I think about it, the more I suspect it must be so. When Patrick came back to Arbroath as a young man in 1842, it was to satisfy a commission to illustrate Walter Scott’s The Antiquary. Two of the sketches he completed for that commission did end up being engraved and to exist as prints. He knew and valued this particular art form. 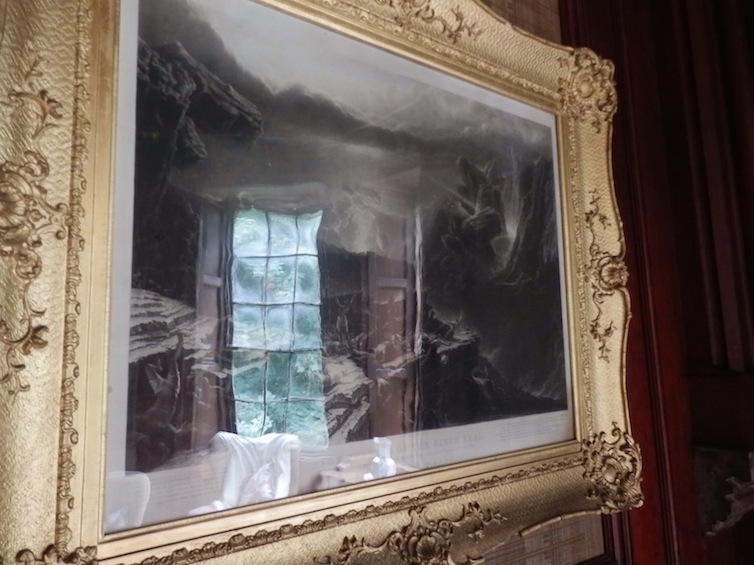 The fact that he chose to have framed prints on view here rather than at Hospitalfield would probably be down to his not wanting the prints to be overwhelmed by oil paintings. As they would have been if displayed in the Gallery. I feel I need to record the scene for posterity. But I can’t get good pictures in such low light conditions, not with my level of skill. Nevertheless, what I can get may turn out to be interesting. The engraving below is called Pity. Three children are feeling sorry for a fallen bird. (Shot by Patrick-Allan Fraser before he even got as far as the grouse moors?) The convention is that the name of the artist is printed just under the bottom left hand corner of the image, but I can’t get close enough to read the name because of the imposing presence of a standard lamp, the reflection of whose shade has insinuated itself into my photograph, along with two other smaller lights from the far side of the room. The composite image is strange - a sentimental view of ‘nature’ has been made surreal by the addition of domestic elements. Moving on, the print below is the one just to the left of the central tapestry. 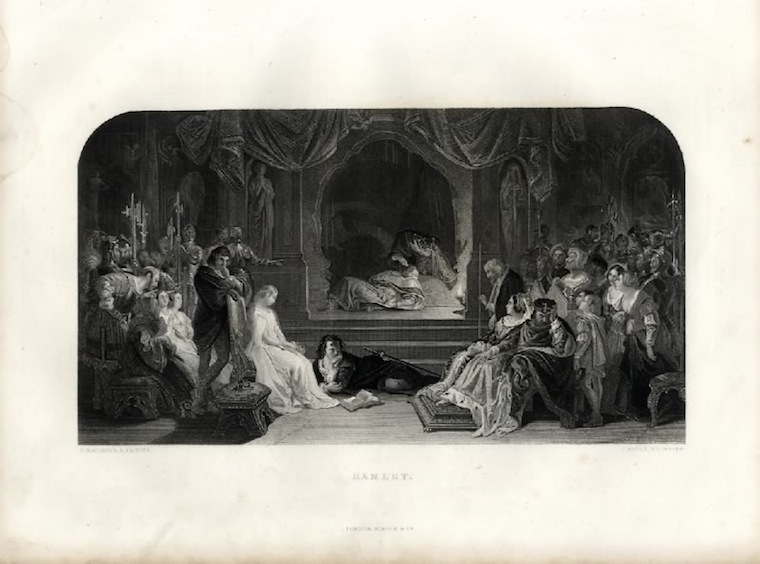 The painter was Maclise and the name of the work is The Play-Scene from Hamlet. 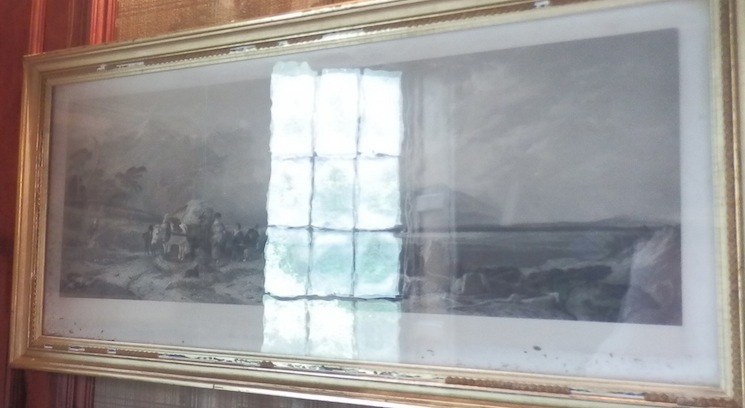 I recall that the original painting was one of the most popular at the Royal Academy Summer Show of 1842, which is the very year that Patrick Allan himself had something included. So he would probably have known the picture very well indeed. In my photo of the print, yellowish lights have again intruded into the scene, which is a bold one. Top centre, a play is being staged where a murder is happening. Directly under the stage, Hamlet is lying on the floor, staring across the room at the man in the audience he believes murdered his father. I’m quite pleased about the reflection of the window that delineates the front of Ophelia and obliterates Hamlet’s brooding head and twisted torso. If I remember rightly, Dickens was a great admirer of Maclise’s original picture. Which is another reason why I’m getting excited about these prints. What is the image inside the crumbling frame below? 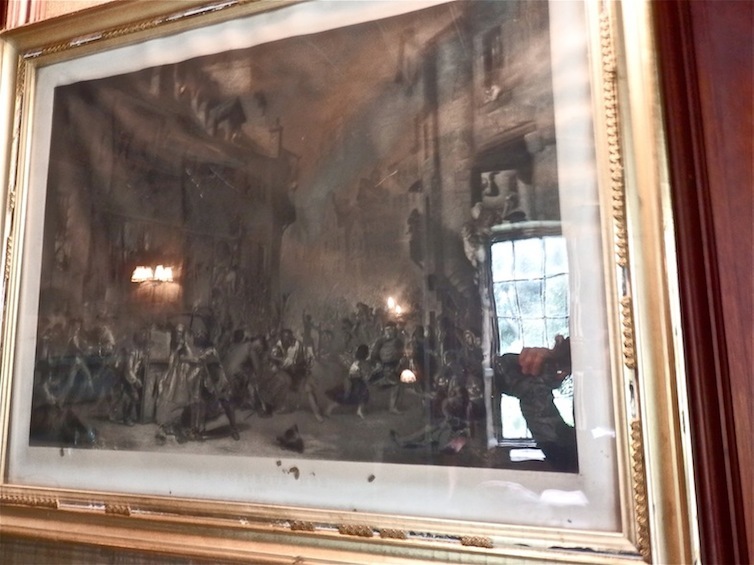 I can read that its called The Porteous Mob and that the painter was James Drummond. 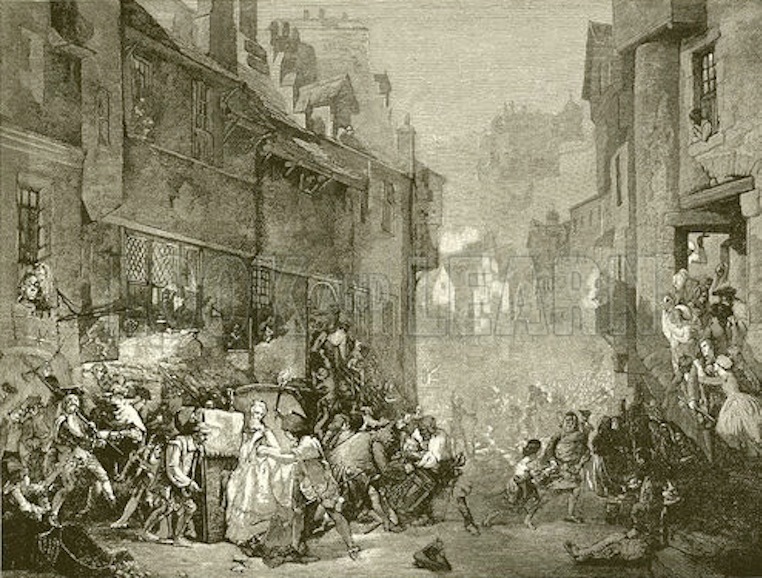 From that I can work out that it’s a crowd scene in Edinburgh, an illustration of an episode from Walter Scott’s The Heart of Midlothian. Now, one of the biggest and most important paintings at Hospitalfield is The Trial of Effie Dean, another illustration from Heart of Midlothian. This room’s decor is looking more and more like a Patrick Allan-Fraser installation. 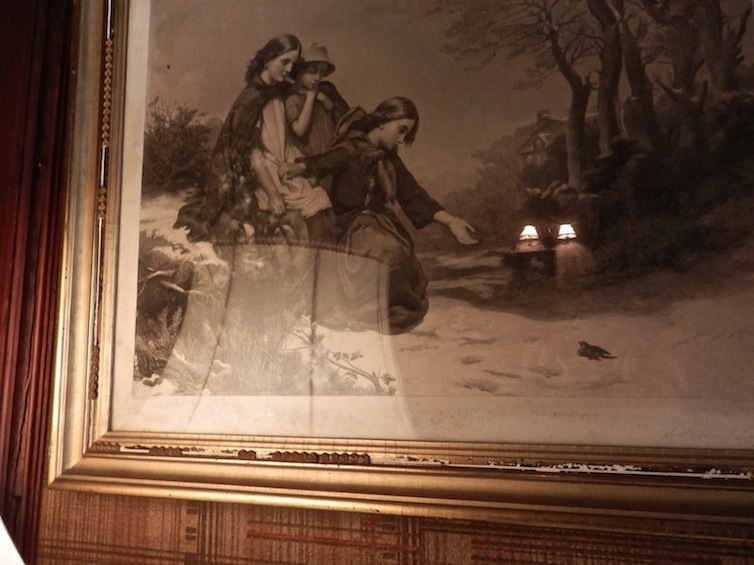 Below is the fourth of four prints running along the east wall of the Drawing Room, as my camera chooses to record it. 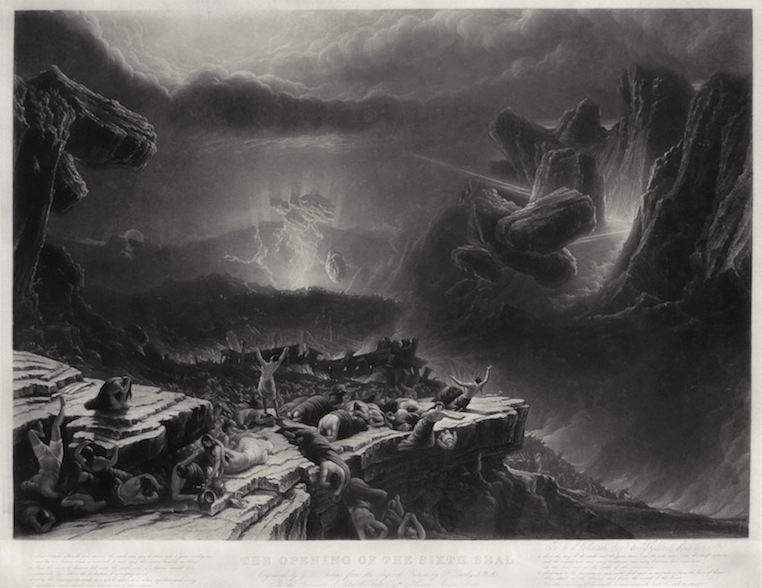 The work is called The Opening of the Sixth Seal and it’s based on an 1828 painting by Francis Danby. You’ll have to take my word for the fact that it shows a mountainous landscape where all hell is breaking loose. There are lots of figures in the foreground lamenting the fact that their world is falling apart. Well, actually, in my photograph there is the reflection of an armchair and a pot, though there’s also a very prominent reflection of a window which does seem to be subject to some kind of meltdown. There are three more prints to record, but there are other people in the room now. Graham McNicol has extracted some documents from the Hospitalfield archive and has lain the material over the piano. Simon Green and Graham are using Patrick’s sketches, together with a map of the present room layout, to work out the order in which the house was built. So it’s not just me that’s trying to piece things together. Not just me that wants the past to remain alive in the present. I slip out of the drawing room and find a staircase going up. Not difficult. But when I get to the room pictured below, I linger. Down one wall are bookcases which seem to contain books, some of which are from Patrick’s time. I’ve already come across volumes of All the Year Round in the Morning Room. I’d been assuming that Patrick stopped taking this publication, edited by Dickens, following the collapse of the Hawkesbury Hall transaction. But it seems he had the weekly magazine delivered to Blackcraig. Those volumes are covered in a layer of grey ashy dust or mould now. Whereas the books in this room are protected by glass. Only me! I thought I might meet Pat today, with his mutton-chop sideboards, but I now suspect I won’t. 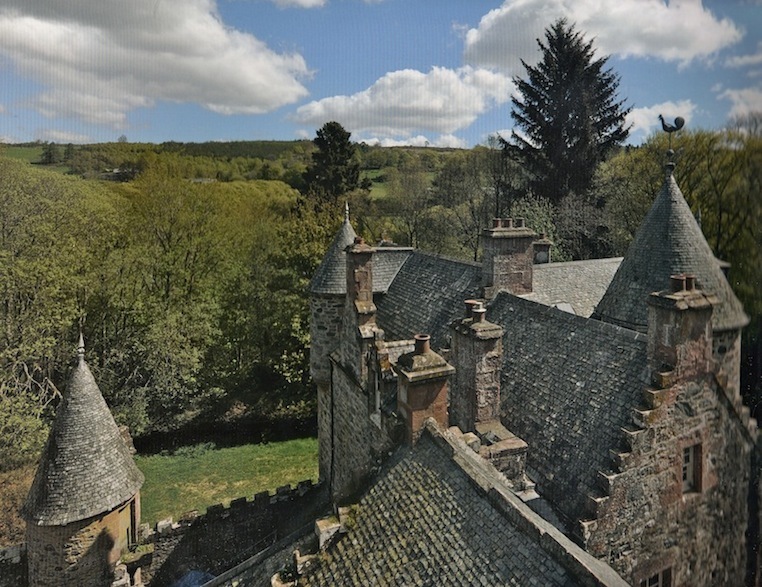 The main reason I was able to talk to him at Hospitalfield is that I lived there for a full month. It’s not the same being in a house like this for two hours. Nevertheless, I must get what I can out of the visit. Next to the room with bookcases is this breeze-blown bedroom. 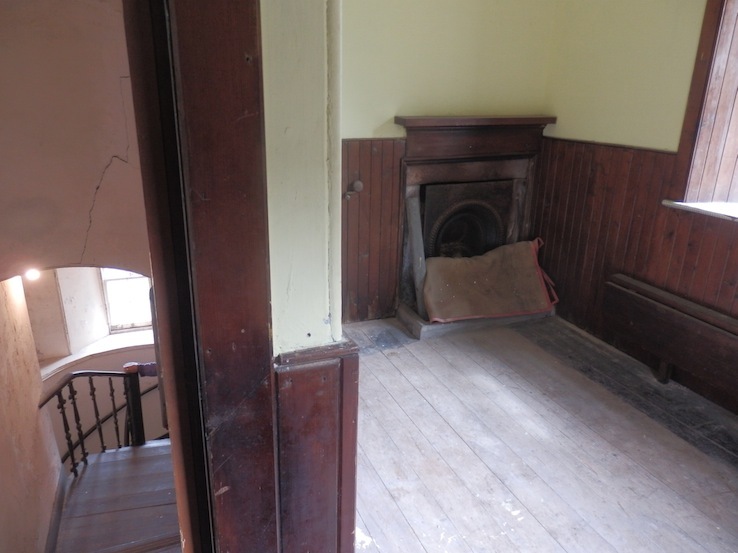 There are ten bedrooms in the house and many rooms that are empty and in need of restoration. 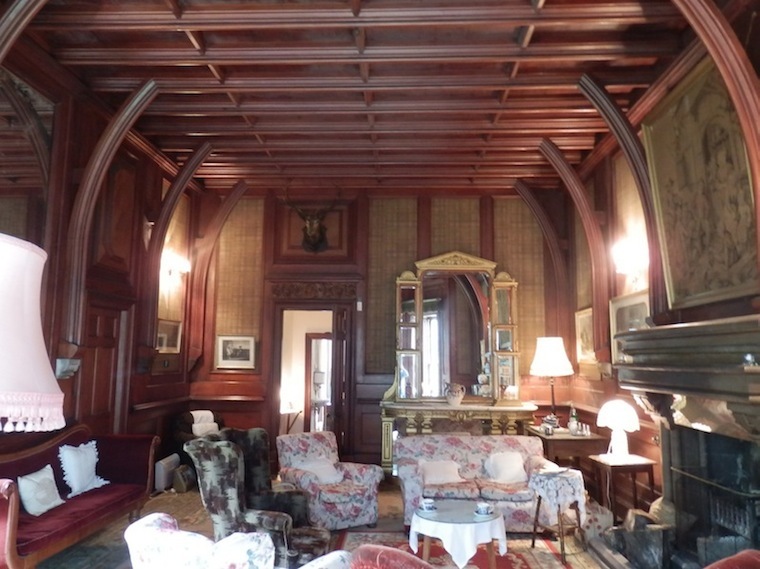 As at Hospitalfield, one just has to accept that some rooms are grand, some functional and others neglected. It’s the price one pays for living in such an inspired structure. 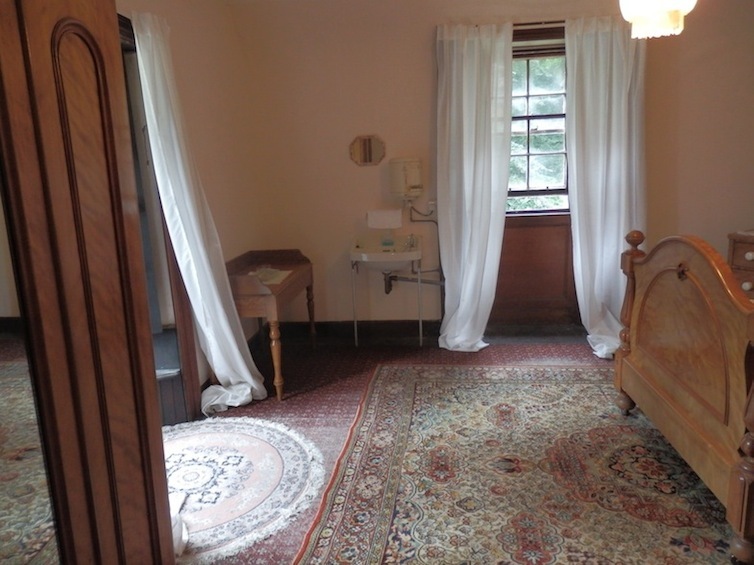 Indeed, it’s not a price, it’s a bonus to have rooms of mystery and rooms of decrepitude under the same roof as conventional rooms like this one. Not that the bed in this room is conventional. 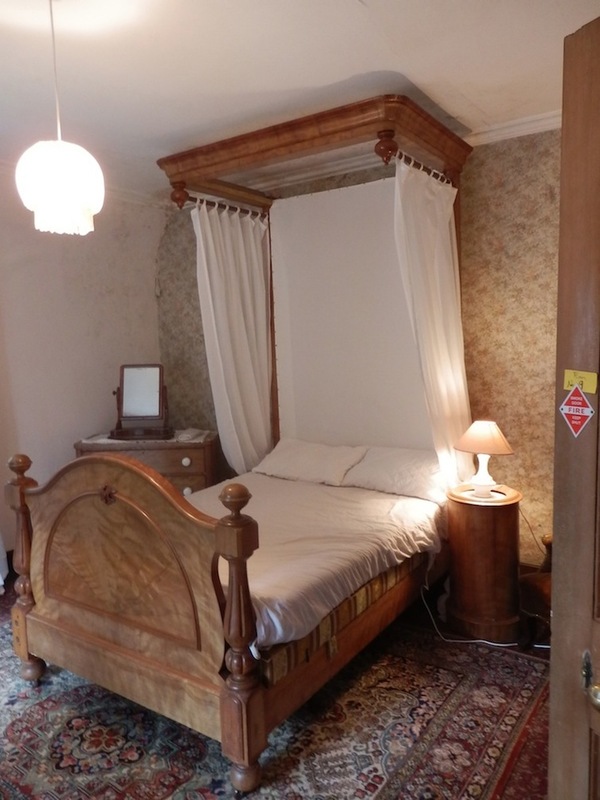 This is the same type of bed I slept in at Hospitalfield. That is, the type where you can’t sleep for fear that the heavy piece of wood that makes up the canopy of the bed is going to come crashing down on you in the middle of the night. I think Patrick was quite right not to have The Opening of the Sixth Seal mounted on the wall of this bedroom, it would have seemed to be tempting fate. Actually, most of the walls in the house are empty of decoration. Patrick and Elizabeth’s visual scheme for the drawing room may have been preserved, but that’s not the case elsewhere in the house. Though the bed itself is surely inherited from the Allan-Frasers. The room is simple. 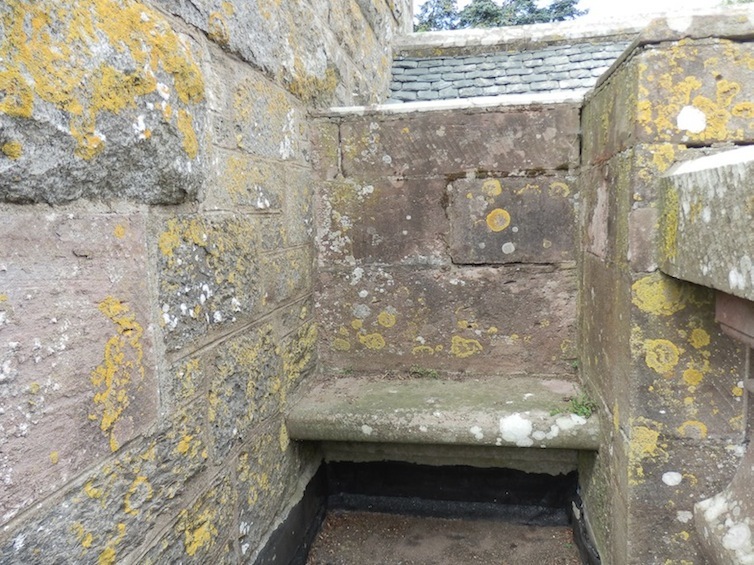 There is a fireplace, two long benches, presently flat to the walls, one window and a way out as well as a way in. In other words there is nothing to keep me here for more than a few seconds and I step out onto the balustrade that goes round three sides of the observatory. 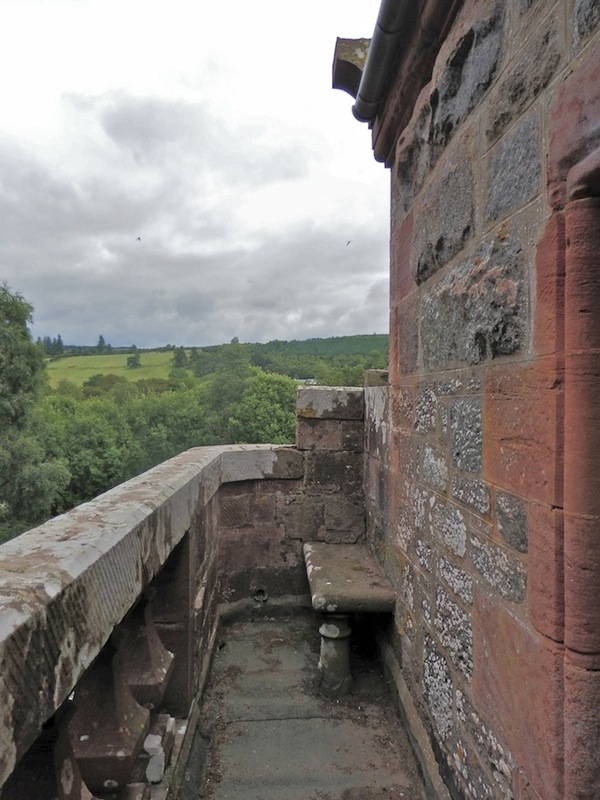 The balustrade is waist high and creates an enclosed-seeming space. There are several tempting seats along its length. The one I’m sitting on looks east towards another seat and beyond that the hills that separate Strathardle from Glenshee. Below is the seat I was sitting on when I took the above photo. From this seat you can either look as I did (from left to right) along to seat one, or look at right angles to that and along to seat three. In the photo below I’ve walked to seat three, turned round the corner and walked a couple of paces towards seat four, before stopping, turning around and taking the photo of seat three! 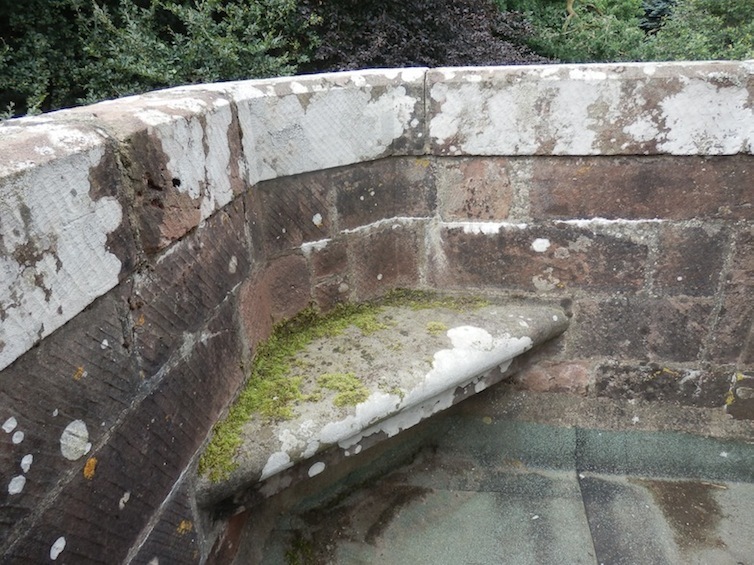 Seat three is the seat I would sit in if it was pouring rain and I wanted to watch the water streaming out of the guttering before disappearing down the hole at my feet. I walk on to seat four. 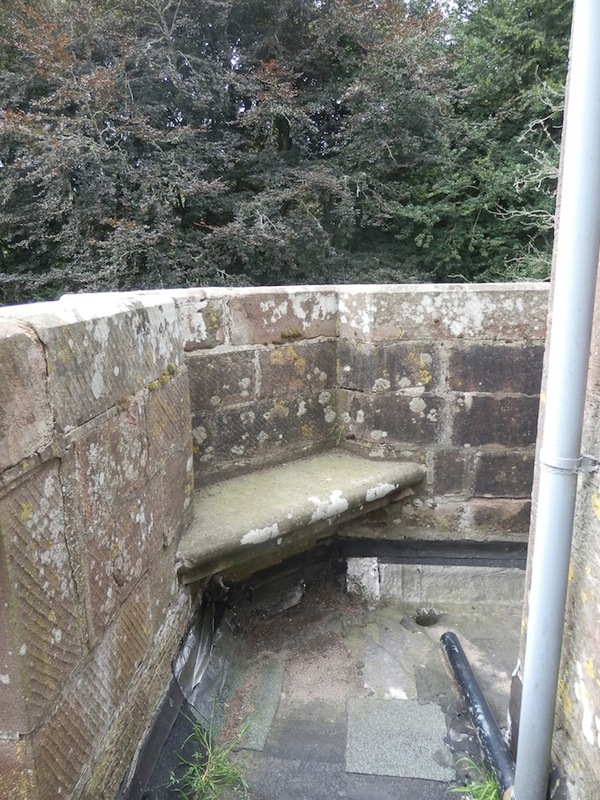 From seat four I can also see seat five, the last of the seats, separated from seat one by some masonry and slates. I feel comfortable on seat four of the balustrade. But would I be more comfortable sitting on seat five? Which begs the question: Are all these seats intended for a single observer? Yes, one has to discover where one is most likely to be able to do the highest quality observing from. That may depend on where the sun is in the sky, where the wind is from, and what one is intending to observe. Patrick Allan-Fraser in his day, or me in mine, must pick the optimal seat before getting down to observing a grain of sand or the universe. In the picture below, I am sitting on the fifth seat looking across to the fourth. And my backside feels rooted to the rock. It’s while sitting on this fifth seat that I open my iPad and look up The Opening of the Sixth Seal on Google. This refers me to The Seven Seals, a phrase in the Book of Revelation that refers to seven symbolic seals (not seats) that secure the book or scroll, that John of Patmos saw in his Revelation of Jesus Christ. 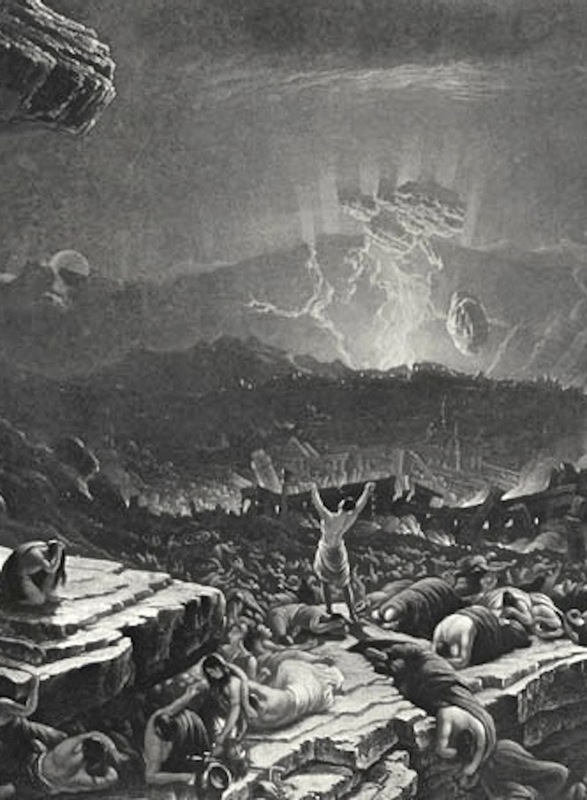 The opening of the seals (not seats) of the Apocalyptic document occurs in Revelation Chapters 5-8. In John's vision, the only one worthy to open the book is referred to as both the "Lion of Judah" and the "Lamb having seven horns and seven eyes". Do I keep reading? I keep reading. Who shall be able to stand? I can stand. I do stand. And what do I see? No apocalypse, then. No apocalypse today. In fact, the day has brightened and members of our party are lunching in sunshine in the grounds below. 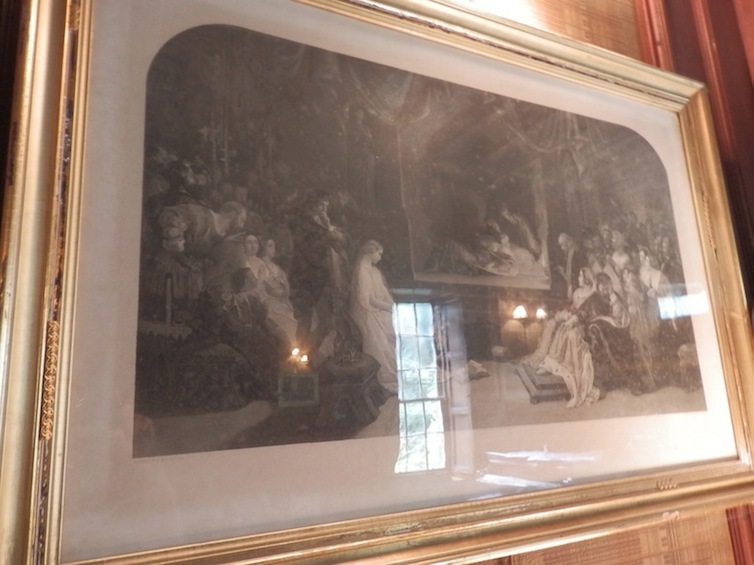 But I think I know why Patrick included the print in his scheme of decoration for the Drawing Room here at Blackcraig. Shakespeare and Scott were supremely talented, but ultimately they shared the fate of all men and women and are now buried in the earth following their own personal earthquakes. God rules. Or at least he did as far as Patrick Allan-Fraser was concerned. God rules for me too. Though I’ve got into the habit of using the word Death instead. The Porteous Mob. 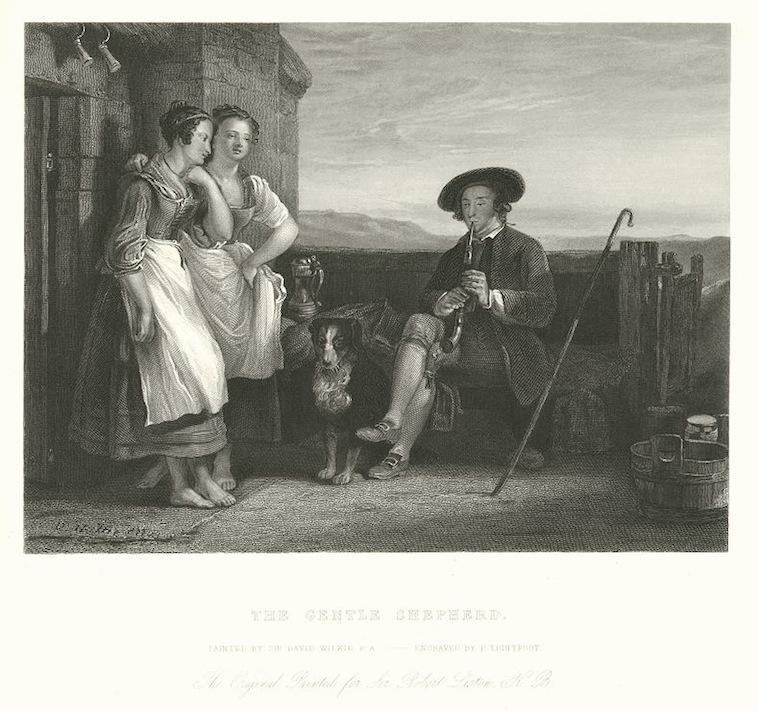 Engraved from an 1855 painting by James Drummond. Robert Burns, engraved by John Le Cont after a painting by Gourlay Steel.